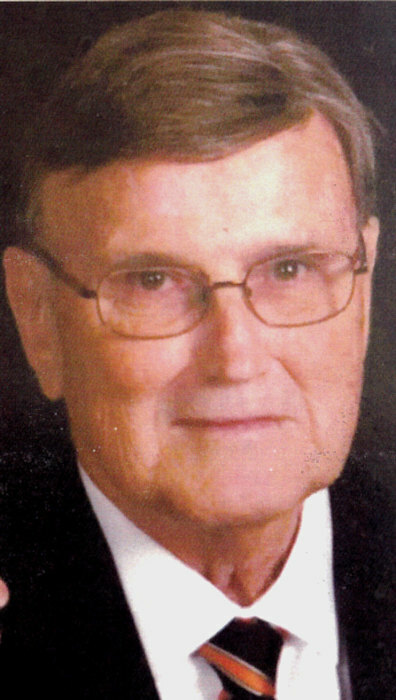 Charles L. Leider, age 86, of Stillwater, OK, formerly of Howard, SD, passed away on Tuesday, January 29, 2019, in Houston, Texas. Mass of Christian Burial will be held at 1pm, Tuesday, February 5, 2019 at St. Agatha Catholic Church, Howard and burial to follow in St. Joseph’s Catholic Cemetery at Howard, SD. Charles was born in Howard, SD, October 12, 1932 to Dr. Louis Leider and Ardath Willoughby Leider. He was proceeded in death by his brothers John and Mark, his sister Barbara Ann and his parents. He is survived by his wife, Yuvone Fleming Leider and his two sons and families, Chuck and Lisa, their daughters Lauren, Logan and Catherine, and his other son Steve and Grace and their son Noah. He was the son of Dr. and Mrs. Louis I. Leider, grandson of Dr. and Mrs. Fredrick Willoughby and John and Mary Leider of Howard. SD. Before graduation from high school he earned the rank of Eagle Scout with Troop 17 at Howard. SD. After graduation from high school starting at the age of 17, he served for two years in the U.S. Army’s 196th Regimental Combat Team’s 147th Field Artillery Service Battery for the South Dakota National Guard at Ft. Carson, CO and Ft Richardson, Alaska during the Korean War. He entered the Army as a recruit and was discharged as a sergeant after which time he attended college. He married E. Yuvone Fleming, a graduate of Murray State University with a Bachelor of Science degree in Nursing, in 1965 in Louisville, KY where she was serving as Director of Nursing at St. Mary & Elizabeth Hospital. Yuvone is the daughter of Rev. T. Ray and Dorothy Mae Fleming of Fulton, KY. During his long distinguished professional 50-year career in higher education, public and private practice where he was involved in preparing several hundred planning projects in the central and western United States, including South Dakota, Saudi Arabia, and Qatar for private and public clients in the United States and overseas. He initiated his career by spending 10 years in public practice working at city, county and state level. He spent the next 20 years in the private sector working with several leading firms. The last 20 years of his career has been in higher education. As a practitioner he was recognized for executing planning and design projects demonstrating innovation in sustainability in community planning and landscape architecture. He actively shaped and improved the quality of life for people in hundreds of communities. These services included providing land development plans, urban design plans, recreation and park master plans, comprehensive plans with zoning and subdivisions regulations and specific plans for communities/counties while he served as Planning Director with the consulting firms of Clark & Enersen of Lincoln, NE and HNTB in Kansas City, S&P Group in Irvine, CA and William Pereira Associates in Doha, Qatar. In South Dakota he was involved in preparing comprehensive plans, zoning and subdivision regulations for Lincoln, Union, Turner and Custer, Counties and all their municipalities, and countywide water & sewer plans for Beadle, Kingsbury, Hamlin, Turner, Davison, Aurora and other ten other counties in South Dakota. In Howard he worked for Howard Industries together with John Haak, Bob Remacle, Gary Bell and Duane Miller from 1983-85 acquiring the former stock yards, clearing the site and developing a master plan for the industrial park, organizing the Miner County Historic Preservation Commission, as well as preparing an economic profile report for the City of Howard for the South Dakota economic development agency. He also created landscape plans for St. Joseph cemetery and the boulevard on Main Street in Howard. In addition, he worked with the South Dakota State University Landscape Design students in developing a greenway and park concept plans for the City of Howard. In 1985 he brought over 20 years of high-quality professional planning practice and teaching experience from the Schools of Architecture at the Universities of Nebraska and Kansas to Oklahoma State University (OSU) where he developed and directed the Landscape Architecture Program from 1985 to 2012. As Director and Professor, he created one of the strongest professional Landscape Architecture five-year programs in the United States. During this time, he established an international dimension to the Landscape Architecture program by creating study abroad programs to Peru and Japan, and domestic and International internships to Luxembourg, Poland and China. In 1993 he established a three-week Studio Exchange Program between the Architecture Program at Universidad Peruana de Ciencias Aplacadas (UPC) in Lima, Peru and the Landscape Architecture Program at OSU for fourth and fifth students. The Peruvian program required joint student teams to work on design projects in each country. This study abroad program became the first landscape architecture program in the U.S. to establish a design study abroad program with a South American university. In 1996 Dr. Leider was awarded a Silver Medal from Universidad Nacional Federico Villarreal, Lima, Peru for establishing the Studio Exchange Program with the Landscape Architecture Program at OSU. In 1998 he created a three-week Landscape Architecture study program with the Kameoka International Center and the Landscape Architecture faculty of Kyoto University to study Japanese historic cultural landscapes in the Kyoto region. The Japanese program emphasizes outdoor sketching of cultural landscapes for second- and third-year students. Both studies abroad programs where open to students and faculty at other universities as well as professionals. Dr. Leider took the lead in creating a research program at OSU in the preservation of historic cultural landscapes in Oklahoma. He did this by conducting a survey and analysis of historic designed landscapes with the Oklahoma Chapter of the American Society of Landscape Architects in 1987. The historic landscapes identified in the survey and analysis report have been used as a source for student work on case studies of Oklahoma historic designed landscapes. His students have won national awards from the Charles E. Peterson Prize competition of measured drawings sponsored by of the American Historic Buildings Survey (HABS) and the Historic American Landscapes (HALS) of the U.S. National Park Service. The drawings from these case studies are deposited in the U.S. Library of Congress and are available on line. Hard copies of the drawings are also on deposit at the Edmond Lowe library on the OSU campus. In addition, he developed self-guided one day driving tours of historic cultural landscapes in three Oklahoma regions which can be viewed on the Oklahoma Department of Tourism website. He is the first native South Dakotan to be named a Fellow in the American Society of Landscape Architects and the only native South Dakotan to be a charter member of the American Institute of Certified Planners. Dr. Leider is a graduate of St. Agatha High School, Michigan State University in Landscape Architecture, Yale University with a master’s degree in city planning, and a PhD in Environmental Science with an emphasis on the Preservation of Cultural Resources from Oklahoma State University. On February 4 2011 he received the Landscape Architecture Distinguished Alumnus Award from the School of Planning, Design and Construction at Michigan State University.